It’s not the sort of recognition any smartphone maker wants, but Android appears to be the platform of choice for nine out of ten mobile malware authors. 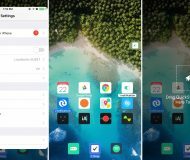 The growth of malware apps targeting users of Google’s mobile operating system rose an unbeliavable 614 percent in just the last year, author’s of a new study found. 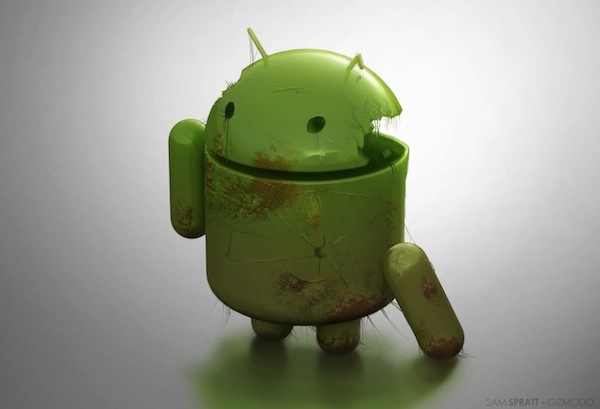 Android-based malware is growing at “a staggering rate,” according to Juniper Networks. 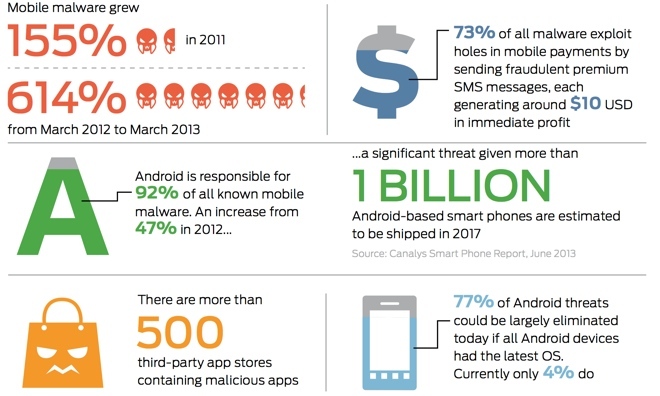 In 2010, Android comprised just 24 percent of mobile malware, the firm’s Mobile Threat Center said. More than 500 third-party Android stores host the malware. In what could be seen as a most unwelcome twist on saturating the market, at 92 percent, mobile malware may have to look elsewhere for increased growth. Then again, the number of Android handsets are always growing. The threat is akin to thieves taking advantage of doors secured with ancient skeleton keys – simply updating the Android software would lock out 77 percent of mobile malware. But actually updating Android software is about as rare as Apple owners with 8-tracks. “Most Android malware could be avoided if users were running the latest operating system, but Juniper’s data says only 4 percent of users are,” the company reports. Apple on its Why iPhone and Why iPad web pages acknowledges as much, writing that App Store apps are “all reviewed by Apple to guard against malware”. But Juniper is in the business of securing businesses, where there can be a bit more control over the update process. 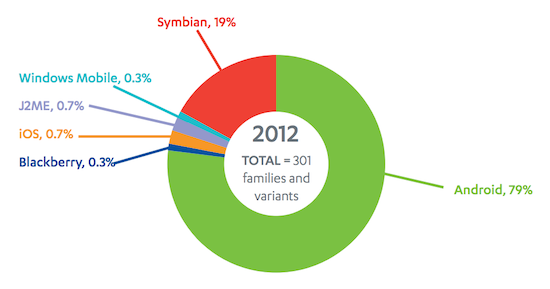 The report highlights other ironies about Android growth as a malware platform. The very global region which is a success for Android sales may also be a hotbed of mobile malware authors – who target Android phones. According to Juniper, three out of every five cases of mobile malware originate in China or Russia. On average, a malware-infected Android phone can send $10 to those writers. 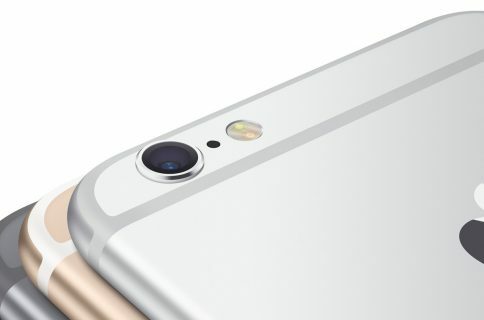 Of course, this latest report comes as no surprise to other mobile security firms. 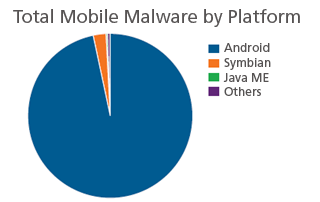 In May, F-Secure announced Android accounted for 91.3 percent of mobile malware episodes. Similarily, McAfee found out that attacks involving Android devices has risen dramatically in the space of just one year (chart above), skyrocketing to more than 36,000 instances in 2012, up from only 792 cases. Apple, which enjoys a good chuckle at Android’s expense, told analysts at its past quarterly report that McAfee Labs determined 97 percent of mobile malware was on the Google software.